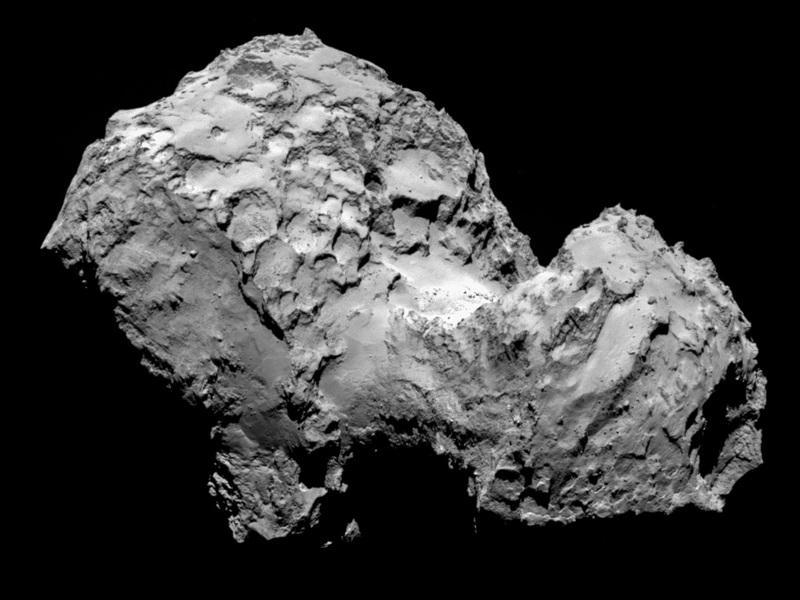 The Rosetta Mission lander is safely on a comet. One of Philae's feet appears at the bottom left of this spectacular image of the surface of C67/P Churyumov-Gerasimenko. Still a happy lander, Philae bounced twice before settling and returning images from the surface, traveling a kilometer or so after initially touching at the targeted site Agilkia. A surface panorama suggests that the lander has come to rest tilted and near a shadowing wall, with its solar panels getting less illumination that hoped. Philae's science instruments are working as planned and data is being relayed during communications windows, when the Rosetta spacecraft is above the lander's new horizon. Buffeted by the solar wind, Comet Lovejoy's crooked ion tail stretches over 3 degrees across this telescopic field of view, recorded on February 20. The starry background includes awesome bluish star Phi Persei below, and pretty planetary nebula M76 just above Lovejoy's long tail. Also known as the Little Dumbbell Nebula, after its brighter cousin M27 the Dumbbell Nebula, M76 is only a Full Moon's width away from the comet's greenish coma. Still shining in northern hemisphere skies, this Comet Lovejoy (C/2014 Q2) is outbound from the inner solar system some 10 light-minutes or 190 million kilometers from Earth. But the Little Dumbbell actually lies over 3 thousand light-years away. Now sweeping steadily north toward the constellation Cassiopeia Comet Lovejoy is fading more slowly than predicted and is still a good target for small telescopes. Mind you, the main OSIRIS camera has more resolution than the NAVCAM, so we'll be getting better pictures soon. And of course, Rosetta is still on the approach! Comet Lovejoy, a bright celestial ball of dust and ice probably born in the Oort Cloud, is currently traveling across the skies of the Northern Hemisphere. While photographer Gerald Rhemann snagged a shot of Lovejoy on December 22 (from the Southern Hemisphere), casual observers in the top half of the world might be able to enjoy the show into February. "Comets this bright [appear only] every few years, on average," says Matthew Knight, a research scientist who studies comets at Lowell Observatory in Flagstaff, Arizona. Indeed, some viewers with keen sight might be able to spy it with the naked eye from a location far from urban lights— think the Arizona desert or Michigan's Upper Peninsula. As seen from the European Very Large Telescope. History was made Wednesday when the European Space Agency successfully landed a spacecraft on a comet for the first time ever. "We are the first to do this - and that [achievement] will stay forever." said Jean Jacques Dordain, Director General of ESA. The comet, 67P/Churyumov–Gerasimenko, orbits, the sun every 6.45 years. It is 2.1 miles wide by 2.4 miles long. Rosetta first launched in 2004 to research the comet, and it didn't arrived at its destination until this past August. 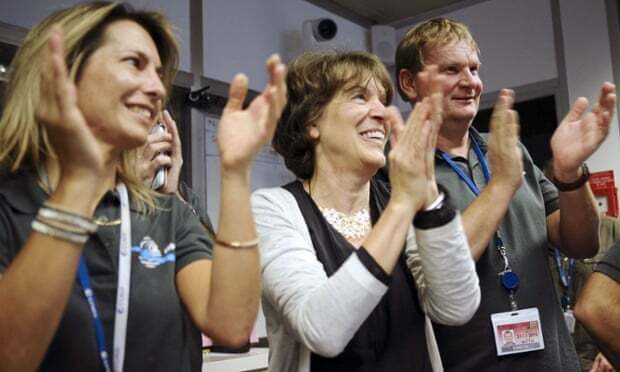 On Wednesday morning, Philae first separated from the probe to attempt a landing. Researchers are hoping to learn more about the origins of the solar system and whether or not comets could have brought water and life to Earth. Watch an ESA animated explanation of Rosetta's journey to the comet and it's surface mission below. What causes the structure in Comet Lovejoy's tail? Comet C/2014 Q2 (Lovejoy), which is currently at naked-eye brightness and near its brightest, has been showing an exquisitely detailed ion tail. As the name implies, the ion tail is made of ionized gas -- gas energized by ultraviolet light from the Sun and pushed outward by the solar wind. The solar wind is quite structured and sculpted by the Sun's complex and ever changing magnetic field. The effect of the variable solar wind combined with different gas jets venting from the comet's nucleus accounts for the tail's complex structure. Following the wind, structure in Comet Lovejoy's tail can be seen to move outward from the Sun even alter its wavy appearance over time. The blue color of the ion tail is dominated by recombining carbon monoxide molecules, while the green color of the coma surrounding the head of the comet is created mostly by a slight amount of recombiningdiatomic carbon molecules. Comet Ikeya-Seki,long-period comet that is one of a group of Sun-grazing comets having similar orbits and including the great comet known as 1882 II. Comet Ikeya-Seki was discovered Sept. 18, 1965, by two Japanese amateur astronomers, Ikeya Kaoru and Seki Tsutomu. Moving in a retrograde orbit, the comet made its closest approach to the Sun on Oct. 21, 1965, at a distance less than a solar radius from the surface.